We have been building on our reputation since 2004, and we are proud of the fact that we fill an important void that exists within our health care system. When you or someone that you love is in a wheelchair, transportation can be challenging. Our drivers are qualified professionals that have all of the necessary insurance and licensing firmly in place. We provide wheelchair transport for appointments with doctors, physical therapy, chemotherapy and radiation treatments, in and out patient hospital visits, adult care facilities, and other types of medical appointments. The cost equation is something that will logically enter your mind if you are in need of wheelchair transportation. Transportation for people with disabilities may sound expensive, and this is a legitimate concern, However, Amera has you covered. We established our agency to assist our global clients in need, we make our services available for booking anytime at compatible rates. Transportation for people with disabilities. In some cases, wheelchair transportation is temporary while someone is recovering from an accident, an injury, or an illness. However, there are other individuals who require ongoing transportation services. Amera is the leading resource for transportation for people with disabilities, and we take our responsibility to our clients very seriously. Transportation for people with disabilities requires certain expertise, understanding, and committed professionals that are trained to make all of our clients completely comfortable during all phases of the process. Amera genuinely cares, and the passion that we have for what we do drives us to excellence. 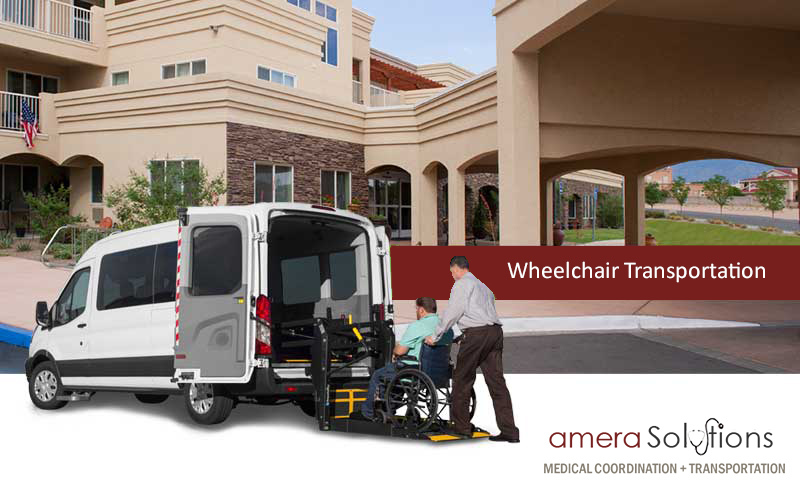 Let’s Discuss Your Wheelchair Transportation Needs with one of our Amera Coordinators! If you have questions about medical transportation, Amera is available to provide you with any type of information. To speak with one of our knowledgeable Amera coordinators, give us a call at 281-872-6400 or 855.AMERA.15 (855) 263-7215. Wheelchair Transport for people with disabilities in Houston, Dallas, San Antonio, Austin, Tampa, Jacksonville and surrounding cities.